Penobscot River at Fort Knox and Bucksport, Maine. Bucksport, Maine, attracts visitors with its location at the head of Penobscot Bay, rich variety of historical and cultural attractions, and countless outdoor recreation opportunities. The area has been drawing people for thousands of years; the first to call this region home were the Red Paint People, a prehistoric culture dating back 5,000 years. Named for the red paint found buried in their graves, this indigenous group sustained themselves through fishing. Their stone weapons and tools were discovered in Maine’s first archeological dig, which took place on Indian Point in 1891. European settlers arrived in 1763, when Colonel Jonathon Buck constructed a store and sawmill on Mill Creek. Today, Bucksport is home to about 5,000 residents. Bucksport and it’s neighboring towns, Orland, Prospect and Stockton Springs, are popular tourist destination that draws visitors year-round. Visitors to Bucksport can’t help but notice the Penobscot Narrows Bridge; this 447-foot tall structure has a 2,120-foot span, but its real attraction lies in the observatory deck that towers 420 feet above the ground. From May to October, visitors can take the elevator to the observatory and take in the 360-degree views of the river, bay, towns and countryside below. Take in some local culture at the Alamo Theatre. Set in a 1916 building, this downtown institution offers a full schedule of classic and modern films as well as live musical, and theatrical performances. It’s also home to Northeast Historic Film, a nonprofit group that preserves and shares the moving image heritage of New England. Learn about Bucksport’s colorful past at the Bucksport Historical Society Museum. Set in an 1874 railroad station, the museum contains artifacts, documents and exhibits, including a model of a locally built sailing ship, memorabilia from an early North Pole expedition and a narwhal tooth. The museum is open in July and August. Enjoy the great outdoors without leaving town at Bucksport Waterfront Park. This green space runs along the Penobscot River and Harbor, with a mile of brick walkways, picnic areas and fantastic views across the river to Fort Knox. The town also maintains a series of interurban trails throughout town, designed for walking and running. In winter, the town’s trails are used by cross-country skiers and snowshoers. For more challenging hiking trials, head to Silver Lake, just outside of town. Silver Lake is also a great venue for boating and water sports. Home to an annual fishing derby, the lake is also a popular setting for kayaking and canoeing. Salt water adventures, from sailing to fishing, are accessed at the town’s public dock. Summer visitors won’t want to miss the annual Bucksport Bay Festival. This annual event, held over a July weekend, features a parade, bake-offs, car shows, karaoke contests, tours of a Navy frigate, a 5K race, performances, and food and artist booths. Scare yourself silly at the annual Ghostport, a Halloween celebration that embraces Bucksport’s many ghostly legends. The festival features a kid’s costume parade, pumpkin catapults, a coffin race and fireworks. Visitors to nearby Orland won’t want to miss the Craig Brook National Fish Hatchery. Founded in 1871, the hatchery’s goal is to restore Atlantic salmon to Maine’s rivers; every year, it produces millions of eggs. The hatchery operates the Atlantic Salmon Museum during the summer. Less than a mile from the hatchery, the Great Pond Mountain Wildlands encompass 4,300 acres of hiking trails and wildlife habitat. Summer visitors can make the hike to the mountain’s 1,038-foot-tall summit. Find the perfect souvenir at H.O.M.E., a craft cooperative that features the work of local artisans and artists. Since 1970, H.O.M.E. has been providing an outlet for home crafters. Today, their headquarters in Orland features a woodworking shop, pottery, weaving and leather studios, and a craft shop. The Orland Historical Society operates a museum from July through September. Set in a former grange hall, the museum’s collections include military uniforms, Native American artifacts, and exhibits that detail the region’s past. On the last Saturday in June, the whole town comes together to celebrate at the annual Orland River Day. Enjoy chili cook-offs, a Downeast raft race, a parade, auctions, eco-tours and a street dance. 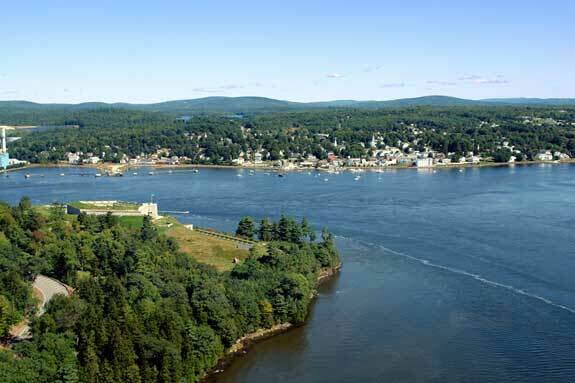 Just across the river from Bucksport, Fort Knox has watched over the Penobscot Narrows since 1844. Constructed as protection against the British Navy, today the fort is open from May through October and is surrounded by Fort Knox State Park. Fort Knox offers several events throughout the year, including cannon demonstrations, guided ghost tours and concerts. Fort Knox festivals include the annual Scottish Tattoo, which features bagpipers and marching bands, and the annual Pirate Festival, when the “pirate” ship Must Roos plies the waters of the Penobscot, offering hour-long sailing tours. Both events take place in July. In September, the annual Medieval Tournament transforms Fort Knox into a renaissance fair, complete with knights, jousting, live musical and dance performances, and food vendors. Bring your camera when you visit Stockton Springs: the Fort Point Light offers scenic photo opportunities. Set in Fort Point State Park, the light was established in 1836. The 120-acre grounds of the state park contain hiking, biking and cross-country skiing trails along beaches and through forests, as well as picnic sites, wildlife habitat and the remains of Fort Pownell. When you’re planning your next visit to Bucksport and surrounding areas, you’ll have a range of lodging options to choose from. Local bed and breakfasts – many set in historic homes – offer cozy accommodations, while outdoor enthusiasts can tent or RV camp in the area’s campgrounds. There are also several locally owned motels to choose from. Dining options abound, as well; from seafood-centric meals served on a deck overlooking the harbor to casual pub fare, ethic cuisine to quick fast-food restaurants, the Bucksport region’s many eateries can match your appetite. Visit the following directories to find lodging, dining, attractions, shops, services and recreational activities in the Bucksport, Maine area.